Located in Kalkajaka National Park in Queensland, Australia, Black Mountain is an eerie sight, to say the least. 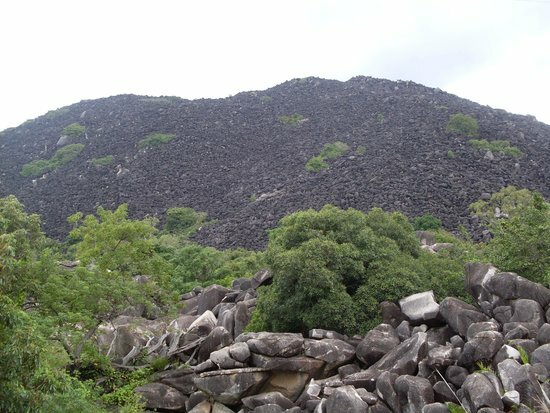 The mountain, which is approximately 16 miles south of Cooktown, consists of enormous black boulders that give it its creepy name. The location has had its share of frightening folklore and strange things happening over the years, such as unexplained lights seen in the area, odd creatures being spotted, and several unsolved disappearances. It’s no wonder that many people are afraid of this area. Today, we’re going to detail several of the strange and mysterious phenomena associated with this strange location. When you look at Black Mountain from afar, it looks like a pure black hill overlooking the green forest below. However, once close to the mountain, it’s easy to tell that it’s made up of huge granite boulders. Several of the boulders are up to 20 feet long and can be seen from up to 900 feet away as they overlook the landscape below. The boulders were created approximately 250 million years ago from solidifying magma. They don’t have any surface soil, but their black color comes from a thin coat of iron and manganese oxides, in addition to a film of blue-green algae that covers the surface. Since the boulders are on top of each other, there are natural passages that have formed under them. The daytime heat causes hot air, and when that air moves through the underground passages people can sometimes hear strange sounds. Those who have heard the sounds from below describe it as sounding like screaming, crying, moaning, and even hissing. Some people have also reported smelling a foul odor coming from underneath the boulders. The Kuku Nyungkal people who live in the area have nicknamed the mountain “Kalkajaka,” which translates to “the place of the spear.” Oh, and it’s also known as “The Mountain of Death.” According to legend, the mountain is said to be home to many evil spirits and demons. One of the most feared spirits is called the “Eater of Flesh,” which is supposedly the ghost of an evil medicine man who craves human souls and will drag people to their deaths if they get too close to the mountain. In fact, there have been many sightings of shadow figures seen on the mountain. To this day, the aboriginal people refuse to go near the Mountain of Death. Many animals are even scared of the mountain, and won’t get close to it. There are said to be some strange forces within the mountain that cause navigational equipment on planes to malfunction and act up. There has also been odd air turbulence experienced by aircrafts flying over the area in the past, which is why planes now avoid flying close to the mountain. Upon investigation by the Bureau of Mineral Resources, it was concluded that there were no unusual magnetic disturbances or radiation levels on the mountain, so it remains a mystery as to why pilots have experienced such strange occurrences when flying near the area. Black Mountain has been associated with UFO activity for many years. People have reported seeing UFOs in the area of the mountain, as well as seeing strange lights. In fact, it is believed by many that the underground passages beneath the boulders could potential hold an alien base, or could be the home of a lost civilization, or there could even be ancient tombs in there. Another common theory is that lost treasures could be hidden down in the passages and caves. The treasures could consist of gold, ancient artifacts, or even old texts. There are three animals that live on Black Mountain that are said to be exclusive to this area. The Black Mountain skink, which is a small lizard that has long legs and a duckbill-like snout, appears black when it’s in the shade but turns green when it is in direct sunlight. Its long legs are colored with flecks of yellow and it has a golden-colored stripe down its back. The Black Mountain gecko is only around at night and is a mottled purple-brown color with large eyes. Although this species of gecko is only found on the mountain, there are several other lizards that inhabit the mountain, such as the ring-tailed gecko, which has several light and dark stripes on its body. The third type exclusive to the area is the Black Mountain boulderfrog, which is extremely small – around the size of a walnut – and has large eyes. They are known to lay their eggs on land instead of in the water, and when they are born they are hatched as fully-formed froglets instead of tadpoles. While the male frogs are a mottled brown color, the females are bright yellow in color. Many snakes are also found on the mountain, such as giant amethystine pythons, spotted pythons, carpet pythons, brown tree snakes, and northern death adders. Some of the pythons that live between the boulders are said to have attacked humans. There are many birds found at the location, including black kites and the rare Australian swiftlets. And of course, there are many bats found there. At least six different species of bats that reside on Black Mountain eat fruits and nectar from the forest, and there are several other species of bats that feed on insects. The only totally carnivorous bat, which is called the ghost bat, is the largest microbat species in Australia and feeds on lizards, frogs, and smaller insectivorous bats. There have been several reports of odd animals that supposedly inhabit the frightening mountain. A big, cat-like predator called the Queensland tiger is said to be responsible for several cattle mutilations in the area. People have described the tiger as a large stripped cat that looks similar to the marsupial lion. What’s odd is that the marsupial lion has been extinct for 20,000 years. The most disturbing report, however, is that of a huge reptilian-human that has been said to live in the underground tunnels. In addition to the many horses and herds of cattle that have gone missing, numerous people have also disappeared in the area, never to be seen or heard from again. It’s as if they vanished into thin air. One of the first reports of a missing person was in 1877 when a courier named Grayner went out on his horse looking for a stray calf, but he never returned. Searches were conducted to look for the missing man (along with his horse and the calf), but they were never found. A few years later, a criminal named Sugarfoot Jack, along with two of his accomplices, were involved in a shootout and escaped to Black Mountain. The police searched the mountain but neither Sugarfoot Jack nor his accomplices were ever seen again. 13 years later, a police officer who worked in Cooktown followed a fugitive to the mountain. They lost his trail outside one of the caves, so the constable decided to enter and look for him. The police officer and the fugitive never exited the cave, and nobody else dared to go in to look for them. Another report is that a local man named Harry Owens went to the mountain to look for stray cattle but never returned home. His friend George Hawkins called the police to say that Harry was missing, and George himself went out looking for him but also disappeared. Police searched the mountain but neither Harry nor George were ever seen again. However, during the search, two officers entered one of the caves but only one of them came back out. The police officer who escaped the cave was so horrified by what he had witnessed that he was unable to give an accurate report of what actually occurred. Two cave explorers tried to solve the mysterious disappearances on the mountain in the 1920s, but both men (along with the people who went searching for them) vanished. There is one account of a person who went missing on Black Mountain and who was eventually found dead. In 1932, a man named Harry Page went hiking on the mountain, and his body was later found. But the cause of death was inconclusive, making his death a mysterious and strange occurrence. While the majority of the people who have disappeared on the mountain are lost forever, there could be a plausible explanation as to why their bodies have never been found. Since the mountain has many crevices, passages, and caves, it’s highly likely that these people fell into one of these dark places and ultimately got lost or hurt and died. Those who have explored the mountain and survived have described themselves feeling confused, lost, and panicked while inside of the dark caves. The inside of the caves have been described as being unpredictable and complex, full of sudden drops, unstable footing, and sharp walls, as well as shifting and dropping rocks and boulders. One expedition to Black Mountain was so terrifying for two men that one of them actually wrote an article about his experience. In 2001, two men named Ivan and Danny decided to camp out one night at the bottom of the mountain. While they were setting up their camp site, they noticed that it was unusually quiet, with absolutely no sounds of animals or birds. That’s pretty unheard of in the wilderness, especially at night. While the two men were sleeping in their tents, they were awakened by the sounds of crumbling rocks that sounded like someone – or something – was coming out of the mountain toward them. The footsteps kept getting louder and closer, so both men ran outside to scare away whoever was trying to bother them. However, what they saw was something completely out of the ordinary and something neither of them ever expected. The two men witnessed a large black mass coming straight toward them. The black mass was moving slowly when it suddenly evaporated and vanished into thin air. Immediately after the black mass disappeared, the men started hearing the sounds of animals, and everything returned to normal. The men, however, were horrified at what they had just witnessed and immediately left the location.